We’re back with another “Behind the news” special, and this one follows in the wake of the Philip Green saga that I emailed you about the other day. As you’ll probably have seen, there’s something of a bandwagon that a number of MPs have jumped on, claiming we need some new legislation to prevent Non-Disclosure Agreements preventing reports to police. But, to be frank, these MPs would be better off studying the law a little harder – they’d soon realise that their point makes little sense. This is an indictable (serious) offence which carries a serious risk of imprisonment, even on a first time conviction. You might think that a number of these examples could only be valid in the context of a police investigation, but in the case of R v Rafique in 1993, the Court held that an intention to pervert the course of justice could happen before the criminal conduct was investigated or even discovered. Concealing evidence is a common example of the offence, and this is often done by the destruction or encryption of hard drives, shredding or burning documents, or hiding things in order to conceal an offence. What’s this got to do with NDAs? In the 1973 case of R v Panayiotou (P), the accused had used a third party to offer money to a woman who alleged she had been raped by P.
P made an offer of money for her silence and was convicted of perverting the course of justice for trying to bribe the woman to withdraw the allegation she had made. It is therefore clear that if you pay money to somebody to withhold details of a criminal offence from the authorities that amounts to perverting the course of justice. The police and the CPS are clearly a law enforcement body. 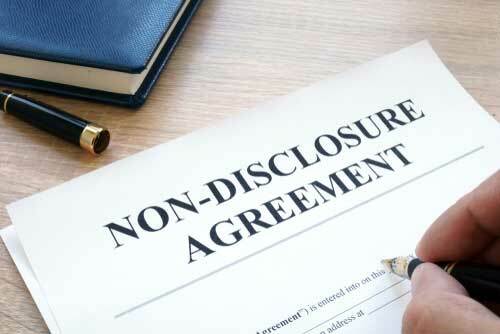 A clause such as the above clearly states that disclosure may be made to the police or the CPS. No solicitor I know would be daft enough to try and insert a clause in an agreement that for the payment of money, the conduct of the employer should be hidden from the police, and indeed, any solicitor including such a clause would fall foul of SRA rules. And even if an NDA did not contain the words underlined above, can you imagine the Court allowing a claim to proceed if an ex-employee made a complaint to the police? Imagine a Complainant (C) has been sexually assaulted at work. They bring a grievance and decide to leave that place of work and a compromise agreement, including a confidentiality clause, is put in place with the Employer (E). The words underlined above are not included. After receiving the compensation payment, the Complainant then reports the matter to the police. E alleges a breach of the compromise agreement by bringing a claim against C in Court. E tells the court it’s not trying to stifle any or impede any prosecution, it just wants its money back because the agreement has been breached. If the action is allowed to continue – i.e. it is not struck out for being an abuse of process – then it is very likely the Court is going to hold any contractual clause which purports to prevent reports to the police void – and probably report the employer and its solicitors to the Attorney General for attempting to pervert the course of justice. In my view, if Sir Phillip Green’s accusers go “public” with their claims (perhaps in circumstances where they feel they can increase the amount of money that they have already received by obtaining payments from newspapers) that would probably be a breach of “NDAs” they had entered into. However, if they reported the matter to the police, that would not be a breach of an NDA and anyone who brought a claim in Court saying that it was would probably be implicitly confessing to attempting to pervert the course of justice.